In this solo dining adventure, Gary is surprised by his Crab House At Pier 39 experience in San Francisco’s Fisherman’s Wharf. Among the many dining recommendations from Yvo over at The Feisty Foodie for San Francisco, there was one that stood out among them. No, it’s not the obvious one like Roti Roll (hers was among several who recommended them) nor was it the niche one like the Vietnamese places in Little Saigon. No, it was the recommendation to have dungeness crab at Crab House At Pier 39 that I singled out. The reason? Because she had recommended a restaurant at Fisherman’s Wharf, a popular destination for tourists. It’s not as though I have a problem with tourist traps. Okay, that’s a lie – I hate them. Fisherman’s Wharf is one of those places where I visited the first time I was in San Francisco and, simply put, have little desire to visit ever again. Think of Times Square in New York City – plenty of tourists but not many locals lurking about, scam artists notwithstanding. So to even consider dining at a restaurant in the mall-like atmosphere of Fisherman’s Wharf was anathema to me. Still, Yvo had never steered me wrong in the past and she’s a dyed-in-the-wool New Yorker so if she recommended Crab House, it must be worth visiting despite the tourist trap perception. So when my companions (JP, Aaron, and Jeremy) and I settled into our table at Crab House on a busy Saturday night, I think we were all pleasantly surprised that it wasn’t the tourist trap we thought (in JP and my case, more like feared) it would be. Were there tourists there? I’m sure there were. But there was a healthy amount of locals there, having a good time, eating pasta and digging into their crabs. Fear abated, we moved onto the order of the evening – dungeness crabs. First, though, we started off with some appetizers. We ordered a few salads to share among us to get us going. We also ordered a medium plate of fried artichokes. 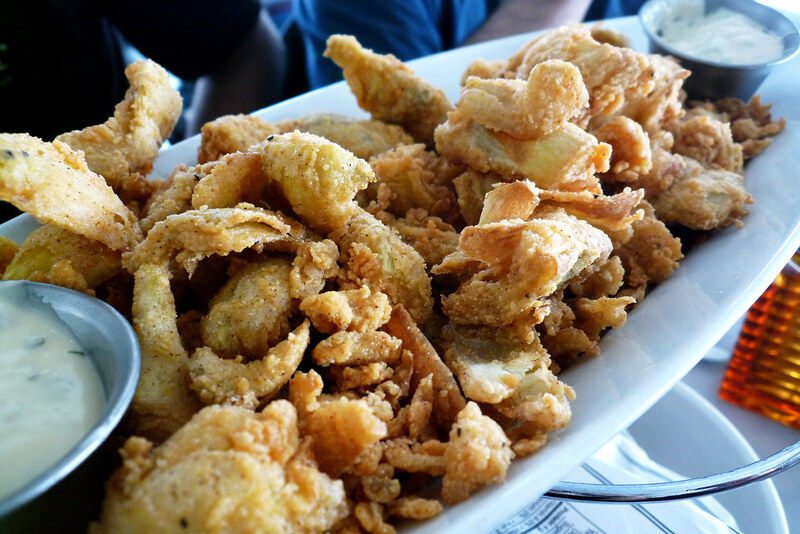 Battered nicely and pleasantly not too greasy, the fried artichokes were a solid appetizer. Really, though, can anything fried truly be bad? A medium order was more than enough for the four of us. Artichokes and salads consumed, finally out came our three pounds of dungeness crab. It comes out sizzling hot on a cast iron griddle (the griddle is hot too – I can attest to that having accidentally putting a finger on it). After the initial sensation of “oh, hot!” you get used to it and then it’s just about getting down to the business of cracking these suckers open. The crab meat is succulent and made even more tasty with a quick swab of the garlicky butter sauce pooling on the griddle. It’s may take a lot of work but be sure to grab every bit of meat you can from even the tiniest of parts – it’s well worth it. 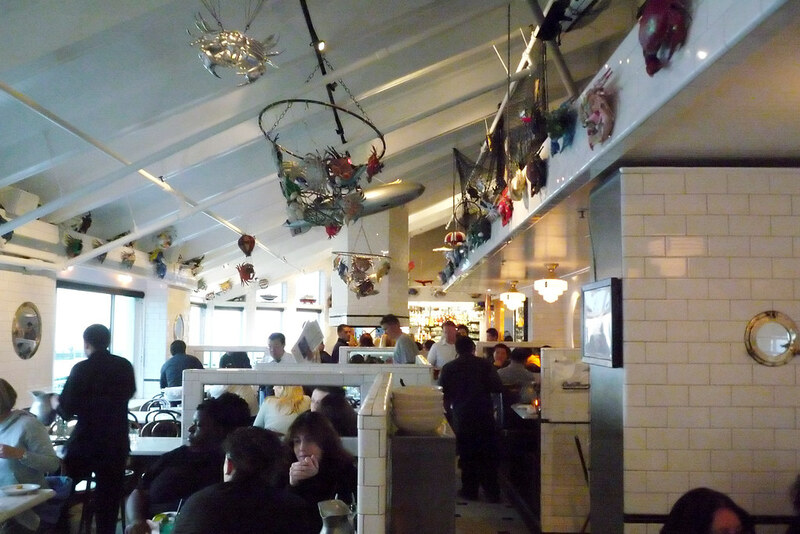 My only other experience with dungeness crabs in San Francisco was the Vietnamese preparation at PPQ Dungeness Island. The way they’re served at Crab House are different and while I think I prefer PPQ’s, I’d still recommend eating here. If you’re a tourist, you can even check off visiting Fisherman’s Wharf from your list of places to see while in San Francisco. It’s not a cheap meal but it’s also not expensive, considering the fact that we’re talking about seafood – that ain’t ever cheap. You don’t need to go overboard with food here, just an appetizer and a whole load of dungeness crab to share among your party will do. After all, why would you want to fill up on anything but the crabs? Crab House At Pier 39. 203 C Pier 39, San Francisco, CA 94133. [Show/Hide Map] (415) 434-2722. Gotta admit this dinner was a real surprise. But I am with Gary it is a strong choice on the Wharf! 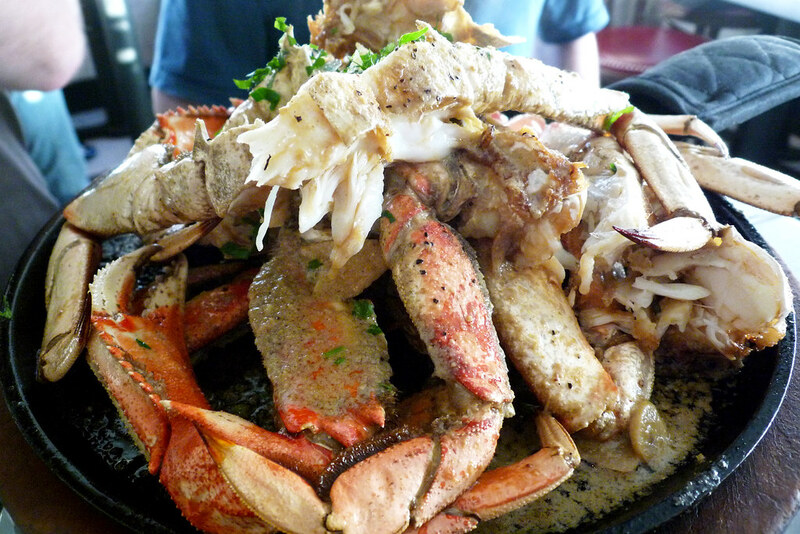 @Justin I didn’t mean to equivocate – Crab House is a solid choice, period, and not just the best of the lot in Fisherman’s Wharf. But, yes, definitely a good place to go if you’re already in the area. @Yvo I’ll be honest, when you suggested Crab House, horrible memories of South Street Seaport’s Seaport Cafe came to mind. It’s nice to know there are decent restaurants even in the most tourist-y of places. Maybe I will try it when I am up there in a few weeks…post some more restaurants Gary! Be sure to let me know which ones you end up going to and any other suggestions you end up with! Reviews like this make our day! Hope we’ll see you again next time you’re out in San Francisco. Hint- the crab enchiladas are a great lunch item. And don’t forget the oyster shooters. Hope you’ll stay in touch- we’re on facebook and also twitter@crabhousepier39. I’m from LA and my girlfriend and I go to SF just for Crab House, it was our first date and she never had crab before. So now we make it a priority to take a trip to SF. Next time try the shrimp and mussels combination, its just as good.